For her final two engagements in Mumbai, Kate repeated the earrings she wore for her arrival the day before: the Cassandra Goad "Temple of Heaven" girandole earrings. This time she paired the earrings with a cream-colored dress by Emilia Wickstead. 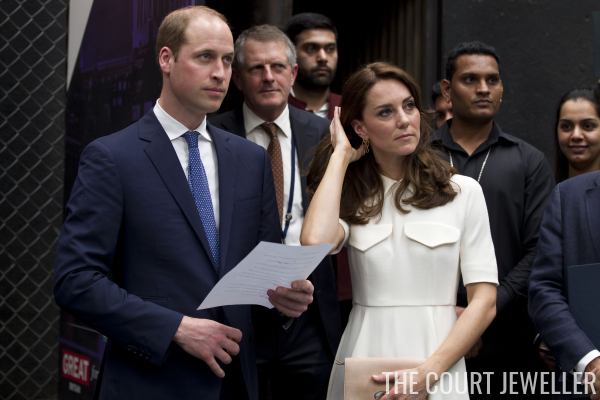 Kate repeated the same clothes and jewelry for her arrival in New Delhi, where she and William laid a wreath at India Gate and toured the Gandhi museum and memorial. Unfortunately, the wind was an issue, and the earrings seemed at times of being danger of catching in her hair. 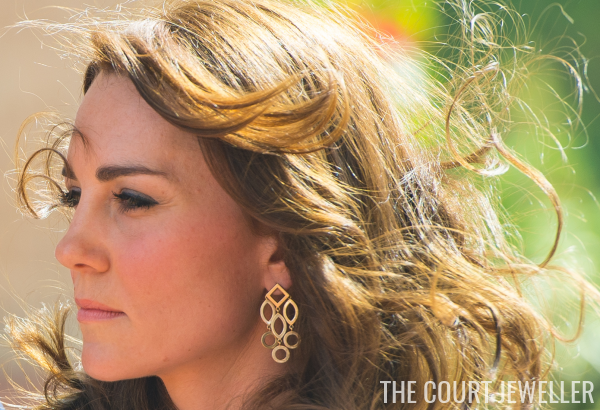 We got another close-up of the earrings during the New Delhi daytime engagements. It's nice to see Kate wearing something other than her usual simple gemstone drop earrings, but I'm hoping she packed a few more pairs for daytime wear!